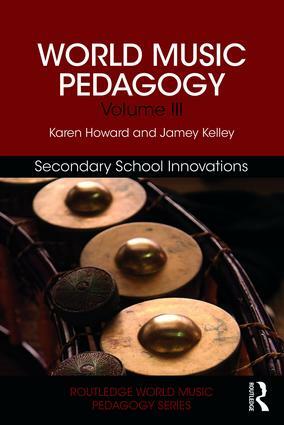 World Music Pedagogy, Volume III: Secondary School Innovations provides a rationale and a resource for the implementation of World Music Pedagogy in middle and high school music classes, grades 7–12 (ages 13–18). Such classes include secondary general music, piano, guitar, songwriting, composition/improvisation, popular music, world music, music technology, music production, music history, and music theory courses. This book is not a depository of ready-made lesson plans but rather a tool to help middle and high school teachers to think globally in the music classroom. Strategies and techniques of World Music Pedagogy are promoted by discussions of a multicultural music education, descriptive vignettes of realistic teaching environments, conversations with culture-bearers/pedagogues, and prompts for self-reflection. This volume approaches important issues of multicultural education and social justice that are often neglected in music education texts—proving to be a valuable resource for both nascent music educators and veteran practitioners alike.